Boolog - It's all about Booray: Not to be confused with NCC--1701D. Not to be confused with NCC--1701D. If you watched "Heroes" on Monday night and then you saw George Takei in a cameo. 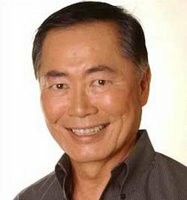 If you don't know who George Takei is, I'm not going to tell you, and you can just stop reading right now. Anyway, at the end of the scene George got into a waiting town car. The license plate number on the town car was: NCC--1701. If you don't know why that's cool, you really should have stopped reading two paragraphs ago.